To get the most out of your camping trip, you need to have good gear. This includes a tent of course, which is a center piece of a camping trip. Since many different camping tents are available, you have a very nice choice in front of you. Perhaps you already own a conventional tent and want to try out something different and more practical. It’s important that your new tent provides good protection and easy setup – and inflatable tents offer just that. You get to skip using the poles, and cut the pitching time significantly which leaves you with more time and energy to do things you actually enjoy doing. When they first appeared, many people were hesitant to give a chance to a pump up tent. They have since made a significant progress and reached a level where they are reliable in every situation. Like with other tents, you can choose size, design, build quality and many other features. We presented different types of inflatables in our list, so you can easily pick out the best inflatable tent for your intended use. Be sure to check the buying guide too, and get detailed information on what to look for, to be sure you’re getting a durable product you’ll be happy with. Fistral Tent One Size Cairo Camo with an interesting design and many upsides. We chose it for a reason – it’s very tough and certified for a 3-season use. Compared to others, it’s fairly compact and can accommodate three people (or two if you need some additional space for your gear). It’s very easy to use – all you need is a pump and the tent will be ready to use in about 5 to 10 minutes. Even though people often doubt the stability of inflatable camping tents, there is no reason for this – especially with this product. It features a geodesic design (Inflatable Diamond Grid) which creates excellent support. The frame on the outside holds the tent body on the inside. As with most inflatables, the structure resembles a bicycle tire. The inner bladder is made from TPU (thermoplastic polyurethane) and holds the air. On the other hand, the outer protective layer is made from high quality polyester, which makes it very difficult for the air beams to get damaged. Even if the damage occurs, you don’t need to worry. The air frame is divided into separate chambers so if one of them gets deflated, the rest will retain the stability. This prevents the tent from collapsing, and also makes reparation process much easier. Each chamber has a dual function valve, used for easy inflation and also quick deflation when you remove the large cap. These valves are located near the bottom of the beams. However, this tent doesn’t have a vestibule, so you’ll need to bring your gear inside. Also, like all other tents, you need to anchor it to make sure it stays in place. As we mentioned, this is a pretty compact tent, best for two or three occupants. The ground area is irregular in shape, but measures 54 ft². This is large enough you can fit a queen-size air mattress inside and have some spare room left. The height inside stands at 40 inches, giving you enough room when sitting. Whole package weighs about 11.9lbs. While this is not very heavy, it’s pretty bulky - the bag measures 16x13x9 inches, so be sure to take that into account when planning. 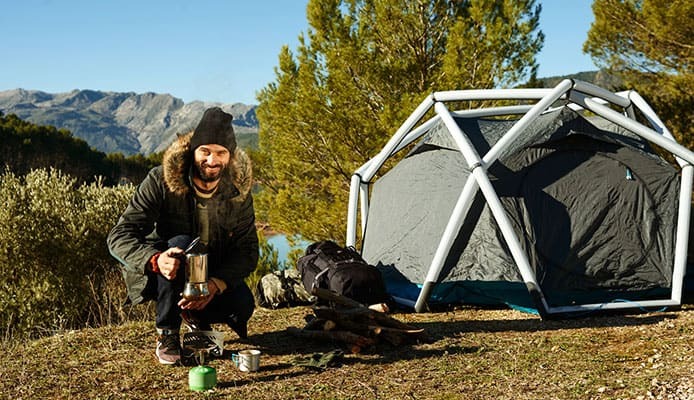 Heimplanet uses high quality materials to ensure the durability of this tent. As we mentioned, the air beams are made from TPU (inside) and polyester (outside), making them very difficult yo puncture. The fly is also made from polyester which has a rating of 66D (denier) and it’s laminated with polyurethane. This gives you excellent water protection, with a hydrostatic head rating of 5000mm. For the body, manufacturer uses ripstop nylon, with 40D rating for the walls and 70D rating for the floor. The ground sheet also has a PU coating, and the same 5000mm waterproof rating so you’ll stay dry from underneath too. 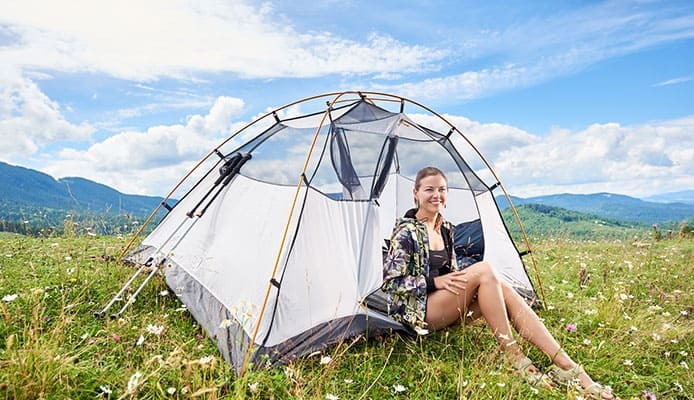 This top rated air tent includes a few features to make your stay better. You will find a gear loft overhead, a few mesh pockets as well as hanging loops to add some light to your tent. The package itself contains not only the tent, but also pegs and guylines for stabilization, a pump adapter and a repair kit. Unfortunately, it doesn’t come with a pump, but you can order it separately from the same manufacturer. Even though the price is pretty steep, we think it’s a smart investment. Build quality is top-notch and if something happens it’s very easy to repair. You can also get a replacement if you want a new part. As a bonus, it has a futuristic look which will certainly stand out. Vango is a well know manufacturer of inflatable tents, and this is a high-quality product which can accommodate 8 people. Despite it being very large, the pitching time is very fast – you can have it up and ready in 10-15 minutes. This makes it an excellent choice for camping with your large family or a group of friends. This tent is designed as two 4-person rooms connected with a vestibule in the middle. Each room has a large zippered door, while you enter the tent using a D-shaped door on the side. The main door has a mesh panel to create better air circulation inside. The vestibule also features two windows which are made from PVC. They give some light to the inside of your tent. The rooms, on the other hand, are windowless (“lights out” sleeping areas) which is more than practical when the sun comes up in the morning and you want to get more sleep. But don’t worry, Vango includes their “air zone” ventilation, so you remain comfortable when spending time inside the windowless area. Tent floor features a sewn-in groundsheet (footprint) which is coated with polyurethane for excellent protection. When it comes to size, this is a really large tent, and certainly the largest in our reviews. The biggest plus is that you have full stand up height in every part of the tent. This includes very tall people too, because the ceiling stands at 80.7 inches. As we said, it’s designed for 8 people so it’s very spacious. You get a total of 200 ft² ground area, which is divided into 78 ft² for the living area, and a combined 122 ft² for the sleeping areas. When in the bag, this tent measures 27.6x16.1x16.1 inches and weighs 47.5 lbs. This makes it impractical for backpacking, but an excellent choice when you decide to go car camping. Vango uses strong materials for their products, and this is no exception. Tent body is made from Protex 70D polyester, which in addition to being very tough is also fire retardant, so you don’t need to worry about your tent catching a spark while you’re lighting a campfire. The hydrostatic head rating is fantastic – at 4000mm you can have a peace of mind that not a drop of water will end up inside. As for useful additions, this tent has a few. The biggest plus is certainly a hand pump which comes with the purchase, and it’s designed specially for their valves. Everything comes in an oversized carry bag, which makes it easier to pack up and go home because it doesn’t require a tight fit. In addition to things mentioned, the package includes tent stakes. The inside features hanging loops for your camping lantern, as well as a few storage pockets. It’s really a well though out product with a convenient design. Pay attention to how you unroll the tent when you open it, so you have a much easier job when it’s time to go home. Even though it’s a bit on the pricey side, it’s an excellent blow up tent for camping you’ll be grateful for. This tent from Tangkula is your best choice if you want to get an inflatable tent, but don’t want to spend hundreds of dollars. It’s compact and designed for two or three occupants. Like other inflatables, you don’t need to assemble anything, just quickly inflate the frame. It features two rooms, one of which is technically a vestibule with great protection. It’s spacious so you can protect your gear from the rain by putting it inside. The sleeping area is separated with a mesh door. It increases the airflow through the sleeping area, but it would certainly be great if there was a window in there too. The design of the whole tent is geodesic, which helps it handle wind really well. It serves as a good sunshade too. This isn’t a very large tent, which makes it practical for backpacking and expeditions. The base measures 87x87 inches. The length is divided to 28 inches for the vestibule, and 59 inches for the sleeping area. Center height of the tent stands at 41in, which is about average tent height. The small weight is an plus, since the whole package weighs only 11lbs, meaning it won’t be a burden while you’re hiking. Even though it’s light, there were no compromises when it comes to materials. It’s made from a strong 190T polyester with PU coating for waterproof properties. The air pipes are made from TPU to make sure they won’t puncture easily. You don’t have to worry about it breaking down on you when you least expect it. The package comes with an efficient little pump which will easily get the job done when you’re setting up the tent. You’ll also get a carry bag, stakes, guylines and an instruction manual to make the process more efficient. As for the tent itself, it isn’t very feature rich but it does have handy mesh pockets. For this price, you can’t beat this tent. It’s easy to carry, fast to put up and simple to fold when it’s time to go. All in all, an excellent choice for two people who are looking into inflatables. Here we have one more product from Vango, slightly smaller and a bit different in design. It’s designed for 6 people, and can be fully set up in under 8 minutes. Like their previous products, it’s an excellent choice for groups and families, but this time a bit smaller and lighter. 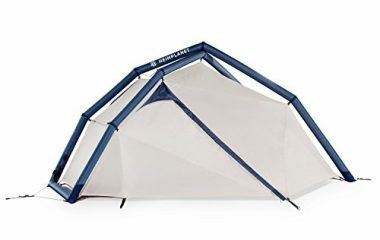 The frame is strong and easily supports this tent size. Beams are pre-angled which allows more space inside. It’s a dual-entry tent with doors located on the front and on the side. The sleeping area is separated with a zippered door and also features the mentioned “lights out” design allowing you to sleep in. It has a linked-in groundsheet which serves as an extra protection layer, and it can be detached from the living area. As for this living area, it has clear PVC windows which let a good amount of light inside. Ventilation is quite good inside the tent, thanks to the “air zone” system which allows air to circulate. As a plus, the inner door which separates the room has a mesh screen which makes sleeping more comfortable. Even though we said it’s smaller than the first Vango product we reviewed, it’s by no means small. When packed, it measures 27.5x14x14.5 inches, with a weight is a little over 38lbs. All this eliminates it as an option for backpack camping, because you need to think about transporting it. However, a big upside is that it has full stand-up height when set up, which greatly increases comfort. 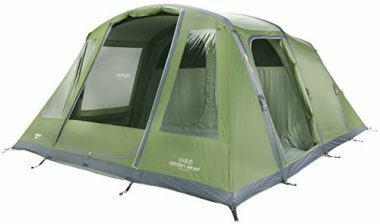 This one also features the Vango Protex 70D polyester as the main build material. It has a 4000mm hydrostatic head rating, which is more than you’ll ever need. In addition to being highly waterproof, it offers excellent durability for a very long time. 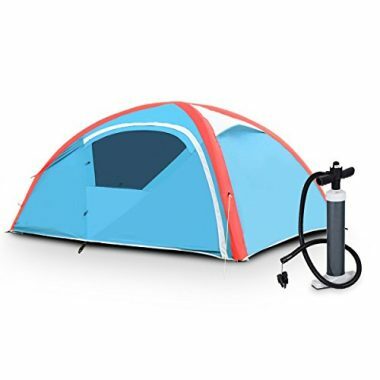 This tent comes with several useful additions and features, first and foremost a manual pump. It’s much easier to know you already have a pump in the bag than to think about getting one separately. The bag itself is oversized so you can put the tent back in more easily. As for the features on the inside, the design includes some storage pockets, lantern hanging loops and an e-port (cable entry) to bring in an extension cord. The Fistral is our second tent from Heimplanet, and it’s a bit smaller compared to The Cave. It accommodates one or two people inside, but it turn offers really small packed size and weight. Also, it sets up anywhere in less than a minute. Despite it being so compact it features two entrances. Each entrance has a nice vestibule in front of it. This greatly boosts convenience and comfort. Because of the geodesic design (the mentioned IDG) it has exceptional stability, in addition to being waterproof. All beams are double-layered (as they should be), but also feature an additional safety system. They are all inflated at once, but if one of them gets punctured the others remain inflated so your tent doesn’t collapse. In addition, each chamber has it’s own valve. If something is to happen, the reparation process is simple and you can get it done quickly. You won’t be able to put a large bed inside or invite friends, but it will be large enough to put your pad and a sleeping bag, as well as a little bit of gear. The ground area measures 45 ft², while the inner tent area is smaller – 31 ft². The inner height stands at 44 inches and since the frame sticks out a bit, the outer height is taller, at 52 inches. As we mentioned, it’s very compact (15x8x8 inches when packed), so you’ll easily be able to attach it to a backpack. In addition, you almost won’t be able to feel it on you since it weighs only 5.5lbs. Choice of materials is very good, giving the tent great functionality and durability. The outer frame layer is made from tough polyester, while the inside air beam is made from TPU. The flysheet (tent body) is made from 40D 240T polyester with a PU coating giving it 2500mm HH rating. The floor, on the other hand, is made from 40D ripstop nylon taffeta, also with PU coating and a HH rating of 5000mm. As you see, this tent gives you exceptional protection from bad weather. It comes with everything you need to safely set it up and conveniently use it. Pegs and guylines are included, as well as a repair kit. Everything is packed in a nice sack to make transportation easier. The inside features a gear loft, making the space more usable. Unfortunately, it comes without a pump, but you do get a pump adapter so you can use a regular hand pump to inflate it. Even though it isn’t very budget friendly given the size, we think it’s worth it considering purely because of the build quality, if you need something to last for a really long time. Since a tent is something which has a large influence on the quality of your trip, you should put some thought into selection. Inflatable tents were made to save you time (and also trouble) compared to regular tents. You can set it up without anybody’s help, which isn’t always the case with traditional tents, especially if they are larger. It’s a great solution when camping with kids for example, because one adult can set up the tent while the other looks after them. On the other hand, depending on the size, some inflatables can be used for backpacking too. However, these inflatable tents can be a bit pricey, so it’s important to learn as much as possible about the features so you don’t regret your purchase later on. Take a look. The biggest upside of self inflating tents is that you don’t need to deal with poles. The frame supports itself thanks to a system of beams which are filled with air and placed in protective casings. This way you get everything pre-attached and you only have to inflate it. Your new tent should have quality valves which will hold the air inside. Some have dual caps so you can both inflate and deflate the tent quickly. This type of tent is generally very stable, even though it comes in different shapes. 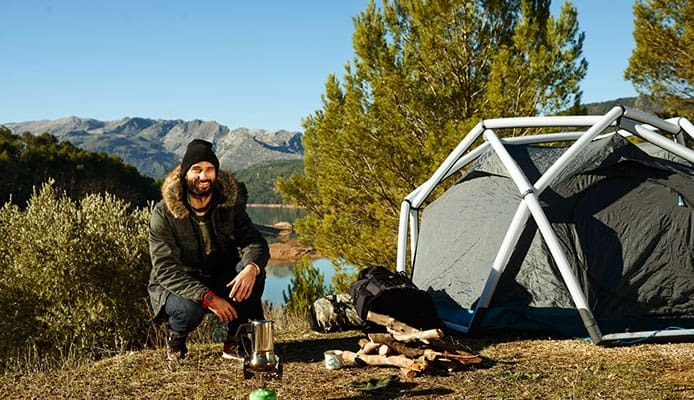 Perhaps the best choice is the geodesic shape if you plan to expose it to more extreme conditions, but they all should work excellent if you anchor it down properly using tent stakes and guylines, as you would do with any other tent. Design has been improving since these tents first appeared, so they are now much more reliable than they were in the beginning. Damage is not very common, and doesn’t occur more often than with any other tent type. The best air tents come with a repair kit included so you can solve the problem on the go. It’s also a big plus if the manufacturer sells replacement parts if something is to happen to your tent. One of the most important things to consider when buying your new tent is how much time you need to inflate and deflate it. Fast setup is one of the main selling points of this type of tent, so be sure you can do it much quicker than pitch a regular tent. In addition, deflation process often takes a bit more time, since you need to remove (almost all) air inside in order to pack it and put it back into the bag. Air beams require a certain amount of pressure to be able to support the tent. While this varies from one product to another, it’s usually around 6 or 7psi. This is something we aren’t able to achieve with our lungs, so you need a pump to do it. A manual pump will do the job just fine, and some tents come with a pump which is a plus. You can also use an electric pump (given that you have the proper adapter), but this isn’t required as the manual ones are much more budget friendly. Like with other tent types there is a nice choice when it comes to size, as you had the opportunity to see in our inflatable tent reviews. Manufacturers usually specify the number of occupants the tent can fit, and also the dimensions of it, both packed and fully set up. The number of users usually means a snug fit inside. If you want a more comfortable fit for example, consider getting a 4-person tent for two or three users. This way you will have room for equipment inside the tent, and also some extra space to move around. There are also products like the Odyssey Air 800 which can accommodate larger groups. It’s not just the floor space that matters, but the height of the tent too – giving you adequate head space. Some are very tall and allow you to fully stand up inside. The tent should at least be tall enough so you don’t hit your head on the ceiling when sitting up straight. Even though inflatable tents are often lighter than traditional ones (if they are the same size), these tents are by no means light as a feather. Consider the total tent weight when deflated, especially if you need to carry it to the campsite. Smart layout can make things better, especially if we’re talking about a large tent for six or eight people. Some compact tents will have a single living space and won’t include a vestibule to leave your shoes and backpacks outside the tent. On the other hand, some will have several living and sleeping spaces as well as a vestibule (or more, if your tent has more than one door). These separate rooms are something which is a huge upside if you’re sharing the tent with your kids or other adults. You can get some privacy and peace, without other people waking you up. Don’t forget to give this a thought before buying. Even if it means getting a slightly bigger tent, you won’t regret it. Proper positioning and number of doors and windows increases the functionality of your tent. Some tents (especially the larger ones) have more than one door which makes entry and exit much easier while other tent occupants are sleeping in the tent. Door shape also varies from one product to the other, and while a T-shaped door gives you the easiest access, other designs can offer better protection. Windows are something almost every tent has, but it’s somewhat different when it comes to inflatable tents. Many products have PVC windows which are excellent in keeping the water and bugs out, but won’t allow air circulation. For this reason always check the breathability of your tent, and whether it has some air vents included in the design. Otherwise you may end up with condensation forming on tent walls, which is not very pleasant. It’s certainly a plus if the windows have a mesh screen on, which allows air to go through but keeps the insects outside. Some windows have fabric flaps which you put on for weather protection and to have less light inside, and then you can roll them to let more sunshine and a breath of fresh air into the tent. Most manufacturers use polyester as their material of choice for making the largest part of these tents. The body, floor as well as the protective casing for air beams are usually made from this material. It’s a synthetic material which performs great in terms of strength, durability and weather protection. Sometimes a layer of PU (polyurethane) is added to block the water from going through, so you remain completely dry inside your tent even during heavy rainfall. One more material which often goes into the combination is nylon, especially ripstop nylon. It’s sometimes used for the floor because it has added strength and it’s more difficult to tear. The air beams are usually made from TPU (thermoplastic polyurethane) or some similar material. It’s important that it doesn’t puncture or tear quickly, while also being completely air-tight so your tent doesn’t deflate. Materials used are in direct connection with the overall quality of your tent, which makes sense. While the best inflatable tent isn’t necessarily the most expensive one, always think about what you’re getting even if you pay a bit more because it will pay off in the long run. It’s always nice when your tent has some added features which make your stay better. Mesh pockets are a big plus, because they allow you to keep some small things close at hand – a mobile phone, flashlight, or your multi-tool. In addition to pockets, some tents have gear lofts, which are overhead compartments where you can place some of your equipment and keep the floors more organized. The walls on some tents have special zippered ports used to bring through an electric cable (if you have it available). As for included extras, it’s much easier for you if the package comes with tent stakes and guylines. This way everything is in the same bag, and you don’t have to worry about bringing additional equipment from home (and possibly forgetting it). Like we mentioned earlier, some products come with a pump included, while for others you need to buy it separately. It’s a plus if the pump also has a reverse function, which helps you deflate the tent. Q: What Is An Inflatable Tent? A: It’s a specially designed tent which has a frame made from air beams which give it support, instead of traditional tent poles made from aluminum or fiberglass. You use a pump to pitch the tent, which is very easy to do. You completely avoid assembly, which is a huge upside for some people. In addition, the air beams give the tent excellent stability too. Q: Why Use An Inflatable Tent? A: There are many upsides to it. Most often you can do the pitching on your own, even if it’s a large tent for 6 or 8 people. You won’t need anybody’s help to hold the bits and pieces. The setup is very fast – most inflatable tents are up in under 10 minutes, you just need to spread it out and inflate. In terms of practicality, it’s almost at the top of the list, along with pop-up tents. As a bonus, you don’t need to study the instruction manual thoroughly in order to successfully put it up. Depending on the material of course, inflatable tents can perform remarkably well in harsh weather conditions. And if something happens, you can often fix it on your own right there on the spot, which you wouldn’t be able to be if a pole breaks on your conventional tent. These tents often come in oversized bags, so they are pretty easy to pack up. However, it needs to be noted that because of all these features and the unconventional design, inflatable tents tend to cost more than other types. Q: How Stable Are Inflatable Tents? A: As we discussed earlier, despite having parts which are filled with air these tents have a certain amount of weight which keeps them down. When you add stakes and guylines to that combo, you get a product which is in no way inferior to a pole tent, so you really have nothing to worry about. In addition, inflatable air beams are very flexible and can’t be damaged by wind, while metal or fiberglass poles can get permanently bent if the wind becomes too strong. Q: Are Inflatable Tents Reliable? A: Yes, they most certainly are. There are some high quality products in this category, which are definitely made to last. They can withstand a good share of wear and tear, and aren’t more prone to damage than any other alternative out there. However, make sure you get to know the particular product so you know what to expect. Like we mentioned, replacement parts are available for inflatables like for any other tent. Q: How Do I Set Up An Inflatable Tent? A: It’s very similar to setting up a regular tent, without the complicated assembly of course. You should first clear the area where you plan to put the tent. Remove sharp objects like rocks on branches which might puncture the tent floor, or create discomfort when you are inside. Afterwards spread out the tent footprint, if you have one. 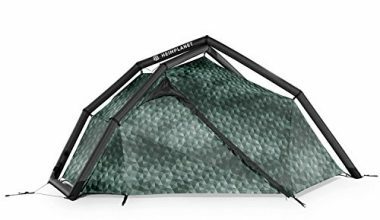 This is very useful because it serves as additional protection to the floor, and also keeps the tent dry and clean from underneath. If you don’t have a footprint, you can use a tarp instead. After this, open the base of the tent and position it properly. Secure it using the stakes, so it doesn’t move around when you inflate it later on. Connect the pump to the valve and start inflating. Some tents can be inflated using only one valve, while others have beams with separate valves. In this case, it’s easiest to start somewhere in the middle and work your way to the sides. Independent air beams are probably a better solution because if one gets punctured the tent will still remain standing. Make sure to insert the remaining stakes as well as connect and anchor the guylines, so the tent becomes fully stable. Q: What Are The Most Common Issues With Air Tents? A: As you would assume, the most common issue you can encounter is having a puncture in one of the air beams. Luckily, this problem is not that common. If something like this does happen, you can locate the puncture and fix it yourself. Remove the air beam from the protective casing, and if you cannot locate the hole by sound or with your fingers, you can put it in a bucket of water, where the small air bubbles will be visible. Then you should use the repair kit as suggested, place a patch on it, put it back into its place and reinflate it. The air inside your tent can change volume in relation to outside temperature. This can create problems, because in cold temperatures the tent may be flimsy, while the pressure inside the beams can become too large when exposed to the sun. A certain variation in pressure does occur during different times of day, so it’s best to inflate to a point specified in the instructions. Acquiring an inflatable tent is a very good choice for anyone who wants to save time and try something a bit different. This tent design has made great progress over the years. In addition to reliable manufacturers like Vango many others are now making excellent tents in this category. 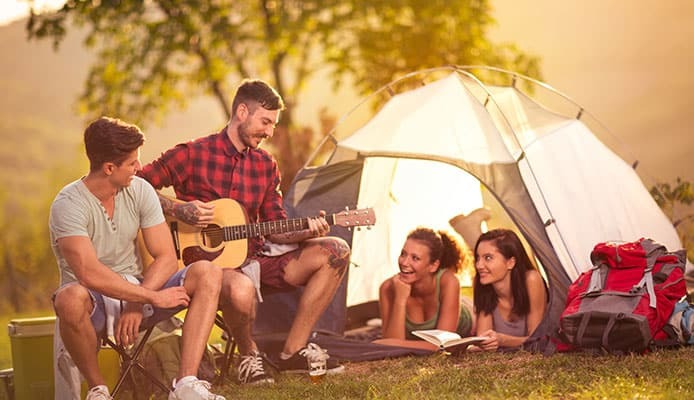 If you decide to buy one, you’ll be making a smart investment which will last for years and make you smile each time you go on a camping trip. You now have the knowledge to pick out the best air tent from our list above, and we’re certain you’ll be happy with it. Have you tried an inflatable tent that made it onto our list? Which model did you get? How spacious is your tent? Did it perform well in different circumstances? Please share your experience with us in the comment section below.